Security is a critical part in your datacenter and with a high virtualization rate it gets even more critical and complex to manage. Gartner estimates that in 2014 roughly 75% of all servers will be virtual with the number continuing to rise, year after year. If you are working in a highly virtualized environment you know how difficult it can be to protect your virtual machines and networks. It is even harder if you are a cloud service provider and you want to protect your customer, sometimes you don’t even have access into the virtual machines and you cannot really make sure the customer does everything right. For some customers I was looking for a solution with centralized management and a solution which has no impact on the performance of the virtual machines. Through some contacts I had the chance to talk with 5Nine Software which offer some great solutions for Hyper-V management and Hyper-V Security. And in December 5Nine Software released its latest beta version of Cloud Security for Microsoft’s Virtualization solutions called 5Nine Cloud Security for Hyper-V. The new version includes some new features like real-time active anti-virus protection, VM Security groups, a new LWF R2 VM Switch extension, role based access and most importantly support for NVGRE or in otherswords Hyper-V Network Virtualization support which will make especially service providers very happy. In my lab I had the chance to have a look at the latest beta and wow I was pretty impressed. Well the installation and the management is so easy, you don’t really need any documentation. That’s how a security product should work, it should not make your environment even more complex it should help you to keep your environment secure without adding extra complexity to it. The Management Service – This would be your 5Nine management server which needs a SQL database (minimum MS SQL Express) and all Hyper-V Hosts are connected to this management server. 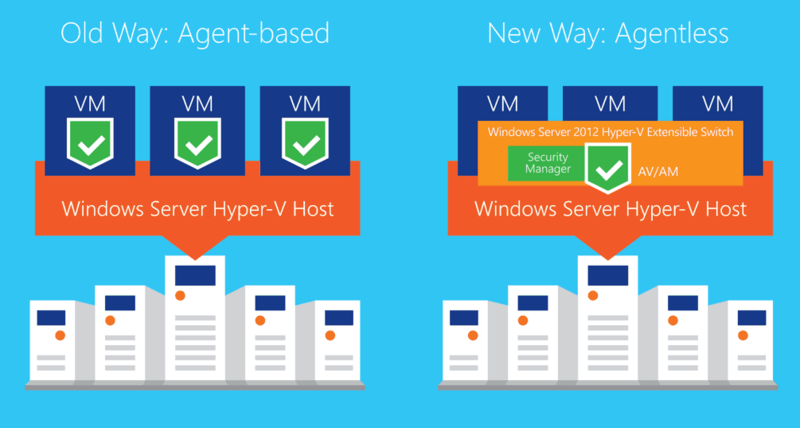 The Host Management Service – which is basically the software and agent running on the Hyper-V host itself. The Management Console – The console where you can configure everything. The console is simply connected to the management server. If we have a look at one of my Hyper-V Hosts after the installation you can see some new things on the server. Basically 5Nine Cloud Security adds some services to the Hyper-V hosts (not to the virtual machines) for management and malware protection. 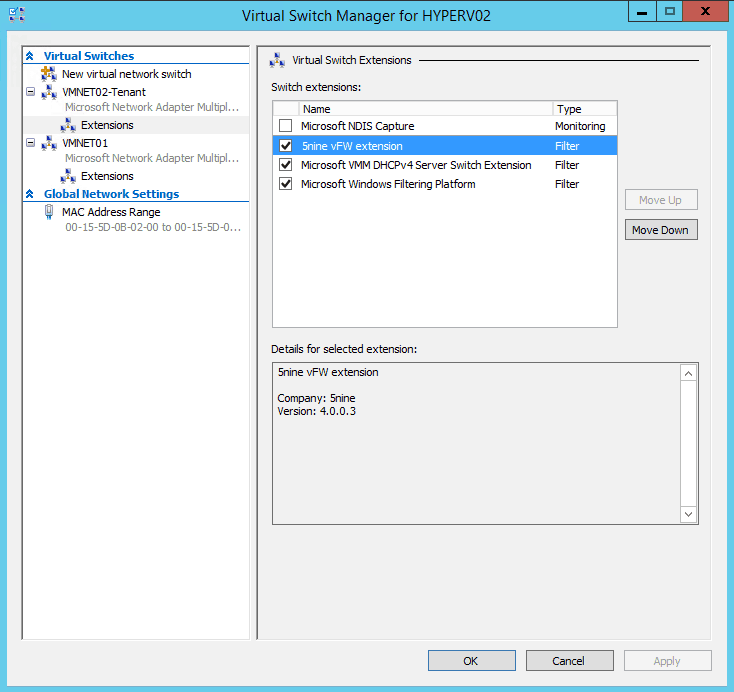 And if we have a look at the Hyper-V Virtual Switch, we can see a new extension added to it. The management console is where the magic happens and you configure your environment. the console in my opinion is pretty simple and you can easy find all the options you need. Besides the Virtual Firewall you can also configure Antivirus Protection, Firewall logging and a lot more. But wouldn’t it be great to just manage this from your favorite Datacenter Management tool, called System Center Virtual Machine Manager? Well in version 3 5Nine had created a plugin for Virtual Machine Manager which allows you so set all the settings directly from the VMM console. As I already mentioned I am pretty impressed and I think this is exactly what a lot of customers and service providers are looking for. It provides a simple, centralized and easy to manage Hyper-V Security solution and integrates perfectly in your datacenter. Thank you for the quick review. As many Hyper-V admins, I’ve been following their products and would appreciate it if you could delve into the NVGRE a bit more when time allows. Thanks for taking the time to take a first look at it. Also waiting for a bit more info about NVGRE and Windows Server Gateway interactions. I will start blogging about Windows Azure Pack and Hyper-V Network Virtualization in a couple of days. Thanks for the review on the product extension. Could you please blog about review of NEC extension too. The VMM plugin looks pretty good and fits the ‘single pane of glass’ approach that VMM should deliver, I see that this is an old review though so I’d imagine the final product is out? Have you seen this used in the field?